RyChol optimises healthy cholesterol and triglyceride levels. RyChol’s unique blend of natural ingredients work by a three-tiered mode of action to reduce bad cholesterol and make it the only over-the-counter product able to lower triglyceride levels. Take RyChol every day to stay healthier for longer. 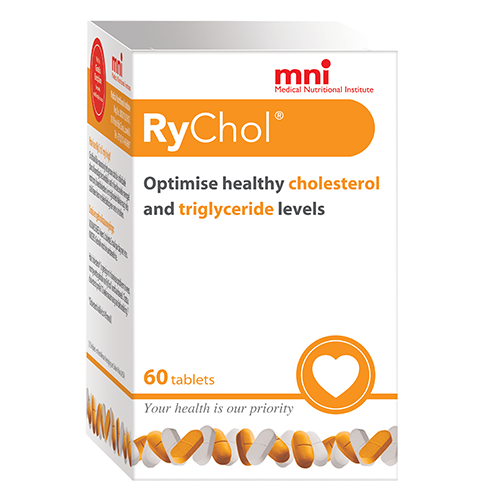 RyChol optimises healthy cholesterol and triglyceride levels. RyChol’s unique blend of natural ingredients work by a three tiered mode of action to reduce bad cholesterol, and make it the only over-the-counter product able to lower triglyceride levels. What can RyChol assist with? RyChol contains a unique blend of plant-derived (phytochemical) ingredients that have each been recognised to improve blood cholesterol and triglyceride levels. These ingredients work together to achieve a multi-modal pharmaceutical action based on the the selective blocking of various biochemical pathways involved in cholesterol absorption and excretion, as well as triglyceride digestion. These ingredients are plant-sterols, apple polyphenols, Barberry root extract and coenzyme Q10. Plant- or phytosterols are naturally-occurring plant fats that are structurally similar to cholesterol. They are present in all vegetable food sources, especially oils and nuts, as well as in minute amounts in food products from fish or animal origin. Due to their structural similarity to cholesterol, phytosterols compete with, and thereby reduce, cholesterol absorption in the intestines. Apple polyphenols. Scientific studies have indicated that the regular intake of apples and apple polyphenols can modify certain biological processes involved in the development of various degenerative diseases. Apple polyphenols have been shown to help block the digestion of triglycerides in the digestive tract, thereby helping to reduce the absorption of fat. Coenzyme Q10 is a fat-soluble anti-oxidant found in meat, fish, dairy, grains, nuts and certain plants. It is present in most cells, primarily in the mitochondria, where it plays a critical role in ATP production, the body’s most basic energy unit. Supplementation of the molecule is especially important to persons on cholesterol lowering therapy, which has the potential to reduce its synthesis and therefore cause deficiency. Barberry root extract contains a bioactive substance called berberine that is naturally found in the roots, stems and bark of various plants. These have been used in both Indian and Chinese traditional medicine for over a thousand years. Berberine has been demonstrated to lower cholesterol levels by increasing LDL-cholesterol removal by the liver, leading to the accelerated clearance of LDL cholesterol from the body. Free from: Sucrose, Lactose, Gluten and Tartrazine. Anyone who is worried about or has a high blood cholesterol level or an increased risk for cardio-vascular disease and stroke can benefit from taking RyChol. RyChol can be used in combination with the statins. What is the usual dosage? Take 2 tablets twice per day with meals. Who should not use RyChol? The individual ingredients contained within RyChol are generally considered to have a low side effect profile. Mild gastro-intestinal irritation, headache and skin rash may occur. Can RyChol be used in combination with prescription drugs such as the statins? Yes, trials done on some of the individual ingredients contained within RyChol, such as phytosterols, berberine and coenzyme Q10, have indicated favourable results when used in conjunction with the class of statins. Where can RyChol be obtained? South Africa At any pharmacy. No prescription is required. Namibia At any pharmacy. No prescription is required. International Email us at info@mnilifestyle.co.za for international purchasing information. RyChol contains a blend of phytochemical (plant-derived) compounds that have each demonstrated an ability to help regulate blood cholesterol levels via a distinctive mechanism, including cholesterol absorption, synthesis, transport and excretion. These are phytosterols, apple polyphenols Barberry root extract and Co-enzyme Q10. Phytosterols Plant- or phytosterols are naturally-occurring plant fats that are structurally similar to cholesterol. They are present in all vegetable food sources, especially oils and nuts, as well as in minute amounts in fish and meat. Although phytosterols and cholesterol have similar chemical structures, they differ markedly in their synthesis, intestinal absorption and metabolic fate. Unlike cholesterol, phytosterols are poorly absorbed. Whilst up to 60% of dietary cholesterol typically undergoes intestinal absorption, the absorption of phytosterols is less than 5%, which explains why the levels of phytosterols found in plant-eating fish and animals are naturally low. Several different compounds found in food and in the body are classified as lipids. These include triglycerides, cholesterol and phospholipids. Because of certain chemical properties, fat cannot be dissolved in a watery medium unless it undergoes a dispersion process called emulsification, which allows it to remain in suspension as micro-droplets. Chylomicrons are micro-droplets that consist of a mixture of triglycerides (85-92%), phospholipids (6-12%), cholesterol (1-3%) and proteins (1-2%). Their function is to enable the transport of dietary and biliary lipids via a watery medium through the intestinal wall. After absorption and as a component of lymph, chylomicrons are transported via the lymphatic system and deposited into the blood stream. There are two dominant sources of cholesterol present in the upper intestine. These are dietary, obtained from food, and biliary, a source derived from cholesterol which has previously been disposed of by the body as a part of bile through the liver. This form of cholesterol is in a highly absorbable format and is subsequently readily reabsorbed. Typically, about 50% of previously excreted cholesterol is naturally recycled via this pathway. Due to the structural similarity to cholesterol, phytosterols compete with cholesterol for assimilation into chylomicrons. By helping to block cholesterol absorption, phytosterols help reduce cholesterol blood levels. Both biliary and dietary sources of cholesterol are affected by this mechanism. By blocking biliary cholesterol, phytosterols offer an opportunity to break the continual cholesterol reabsorption cycle. Several human studies (n =16) published prior to the year 2000 have evaluated the effects of phytosterols supplementation under controlled conditions. Collectively, it was found that phytosterols supplementation in various formats including foods, beverages and supplements, was accompanied by an average 10% reduction in total cholesterol and a 13% reduction in LDL cholesterol levels (number of subjects = 590) (Moghadasian et al. 1999). Later studies (n =17) demonstrated similar cholesterol and LDL lowering effects (number of subjects = 994). One study quantified the role that phytosterols play regarding the inhibition of cholesterol absorption by measuring the uptake of radioactively marked cholesterol isotopes in human volunteers over a ten-day period. This study determined that the presence of phytosterols reduced tracer marked cholesterol absorption on average by 42% (Ostlund et al. 2003). Two studies evaluating the long-term effects and safety profiles of phytosterols concluded that the cholesterol-lowering benefits were sustained over the long term (Miettinen et al. 1995, Hendriks et al. 2003). Pharmacologically, phytosterols can therefore be viewed as cholesterol-absorption inhibitors, meaning that they help prevent the uptake of cholesterol from the small intestine. Apple polyphenols Apples contain several biologically active polyphenols that include the flavonoids and phenolic acids. Observational studies have indicated that the regular intake of apples and apple polyphenols demonstrate a significant potential to modulate several disease processes involved in the development of various degenerative disease states associated with premature death (Boyer J et al. 2004, Hyson DA et al. 2011). In a recent overview published in the British Medical Journal (BMJ), researchers concluded that the positive health benefits associated with the intake of one apple a day were statistically equivalent to the estimated annual reduction in death from cardiovascular events achieved by the statins, a class of pharmaceutical drugs that lowers blood cholesterol (Briggs et al. 2014). Research has indicated that various biological targets and molecular pathways are involved in the beneficial effects of apple polyphenols. One of the many purported health benefits that apple and apple polyphenols display is the ability to help lower blood cholesterol levels. In contrast to phytosterols that directly reduce blood cholesterol levels by blocking cholesterol absorption, apple polyphenols indirectly reduce blood cholesterol levels through a different mechanism that involves the absorption of triglycerides. Besides cholesterol, it is well known that other dietary fats also play a dominant role in determining cardio-vascular risk. Of particular significance is saturated fat, which largely consists of triglycerides, comprised of individual fatty acids. Collectively, triglycerides constitute the dominant source of fat within a typical Western diet (90%). Large fatty acid chains cannot be absorbed into the bloodstream until they are reduced in size. This happens naturally through the action of enzymes during digestion, a process that leads to the separation of chemical bonds that join individual fatty acids. In the human body, this process is catalysed by several digestive enzymes called lipases. Fat digestion, or lipolysis, starts in the stomach and continues in the duodenum by means of the combined action of various lipases. The rate at which lipolysis takes place and the consequent supply of free fatty acid to the body can be affected by many factors. These include lipase levels and activity, as well as the presence of lipase inhibitors, agents that reduce the biological activity of lipase. In the continual search for novel anti-obesity agents, numerous plant-derived phytochemicals have been screened for lipase inhibitory potential. One study examined 132 extracts derived from 106 plant species, used either as food or for traditional medicinal purposes (Tucci et al. 2010). Of these, 26 test extracts inhibited lipase activity by at least 40%. By comparison, extracts from apples demonstrated more than 70% lipase inhibition, a result equalled by only 9 other test extracts. On a cellular level, a study determined that apple polyphenol extracts decreased cholesterol synthesis and lipoprotein secretion in human enterocytes in a dose dependant manner (Vidal et al. 2005). Studies have also examined the correlation between apple polyphenols supplementation and blood triglyceride levels in vivo. In a triglyceride tolerance test on human subjects, the ingestion of apple polyphenols significantly inhibited the usual post prandial increase in plasma triglyceride levels after meals (Sugiyama et al. 2007). A randomised double-blind, placebo-controlled study examined this effect in correlation to blood cholesterol and LDL levels in human subjects (n=71). This study found that the presence of apple polyphenols significantly reduced total cholesterol and LDL levels (Nagasako-Akazome et al. 2007). Pharmacologically, apple polyphenols can therefore be viewed as lipase inhibitors, meaning that they help block the digestion of saturated fat in the intestine, and by doing so, potentially help prevent fat uptake from the small intestine into the body. Barberry root extract TrimoStat is a proprietary formulation prepared from Barberry root extract. Its main constituent is berberine (C20H18NO4+), a phytochemical compound belonging to the isoquinoline group of alkaloids which is naturally found in the roots, stems and bark of plants such as Coptis chinensis (Chinese Goldthread), Berberis vulgaris (Barberry) and Hydrastis canadensis (Goldenseal). Berberine, in these forms, has historically been used in both Ayurvedic and Chinese traditional medicine for over a thousand years. Its medicinal indications include the treatment of diarrhoea, obesity and diabetes. Berberine has been tested in various animal, experimental and human studies and over two thousand publications on berberine appear in scientific literature. These include studies on the ability of berberine to lower cholesterol levels. After absorption and upon entering the bloodstream, chylomicrons containing large quantities of triglyceride and cholesterol are reduced in size into an assortment of lipoproteins through a range of consecutive steps. These are distinguished by their size, density and the proteins that they are composed of. Within its core, Low Density Lipoprotein or LDL contains the highest number of cholesterol molecules (1500 is commonly cited as an average). Its main function is to transport cholesterol from the liver to the peripheral tissues via the blood stream. Being a large particle, LDL cannot pass through the outer membrane of a cell without the assistance of a specialised mechanism which involves the LDL-receptor (LDL-R), located on the surfaces of cells. When LDL binds to LDL-receptor, the LDL/receptor complex undergoes engulfment via endocytosis and is subsequently dismantled by intracellular lysosomal enzymes. Once inside a cell, cholesterol is released where it is used for the synthesis of plasma membranes, steroid hormones and bile acids. Outside the cellular environment, however, cholesterol may be deposited within the arterial wall, leading to atherosclerosis. For these reasons, elevated LDL levels play a significant role in the development and progression of atherosclerosis. It is therefore a therapeutic objective to reduce LDL blood levels. The LDL-receptor (LDL-R) is an integral component of cholesterol homeostasis and the regulation of blood cholesterol and LDL levels. Various factors determine the rate of LDL cholesterol transport between the liver and the peripheral tissues. One of these factors is the number of LDL-receptor sites available on cell surfaces. When LDL-R numbers are inappropriately diminished as a result of genetic defects or in response to regulatory signals, this protective mechanism is lost, cholesterol builds up and atherosclerosis ensues. As in all cells and all receptor sites, the number of surface receptors available is a dynamic process which can be internally adjusted via a regulatory feedback mechanism. During down-regulation, a cell decreases the number of available receptor sites, whilst with up-regulation the number is increased. Within the body, the liver is the central platform for the handling of all lipids. The number of LDL-R expressed on the surface of hepatocytes (liver cells) is one of the primary determinants of plasma LDL levels. Increased numbers of hepatic LDL-R via accelerated LDL-R expression results in improved clearance of plasma LDL through receptor-mediated endocytosis. Thus, LDL-R is considered a potential target to help lower LDL levels. In search of novel agents to up-regulate LDL-R on liver cells through LDL-R expression, various phytochemical compounds used in traditional Chinese medicine were screened (Kong et al. 2004). Among 700 plant test samples, berberine demonstrated significant activity for increasing LDL-R through expression on human liver cell lines (HepG2), scoring the highest value of all test compounds. Various subsequent studies have repeated these findings, thereby confirming this observation (Adibi et al. 2005, Brusq et al. 2005). Other in vivo studies have examined the molecular pathways involved in LDL-R up-regulation at cellular level (Lee et al. 2007, Li et al. 2008, Li et al. 2009, Wang et al. 2009). In vitro studies have also examined this effect in human subjects. Several outcome based studies have consistently documented the ability of berberine to lower both cholesterol and LDL levels. This includes a study on subjects with established liver disease (n=86), where all candidates achieved a significant reduction in cholesterol, LDL and triglyceride level. In this study no significant clinical side-effects were reported and biochemical parameters including liver function remained unaltered (Jiang et al. 2008). Pharmacologically, Barberry root extract can therefore be considered a LDL-R up-regulator, meaning that it could potentially help lower blood cholesterol and LDL levels through increased LDL clearance and excretion by the liver. Coenzyme Q10 Coenzyme Q10 (CoQ10) is a fat-soluble anti-oxidant found in meat, fish and dairy, and to a lesser degree, in grains, nuts and certain plants. It is present in most cells, primarily in the mitochondria, where it plays a critical role in ATP production, the body’s most basic energy unit. CoQ10 shares a biosynthetic pathway with cholesterol. The synthesis of a precursor of CoQ10, mevalonate, is inhibited by several medications, especially the statins, and to a far lesser degree by certain antihypertensive agents. Some research therefore suggests that under these conditions, supplementation with additional CoQ10 may offer a health benefit. • Our cholesterol lowering guidelines have been designed specifically for heart health.